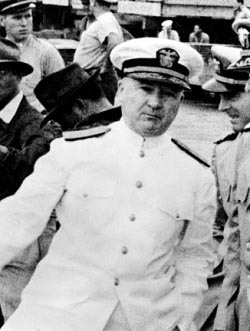 The Pacific War Online Encyclopedia: Furlong, William R.
Naval Historical Center #NH 50002. William Furlong was chief of the Bureau of Ordnance in 1939 and was instrumental in the decision to purchase a Bofors antiaircraft gun for evaluation by the Navy. By late 1941 he commanded the minecraft of Pacific Fleet and was on his flagship, Oglala, when the Japanese struck at Pearl Harbor. He discovered that he was the senior officer present afloat and ordered the fleet to sortie. Subsequently promoted to commandant of the Pearl Harbor Navy Yard, Furlong oversaw the salvage of Oklahoma.